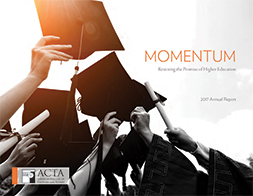 ACTA has gone from strength to strength in advancing our mission to ensure that American higher education is the finest in the world. We have led schools, from coast to coast, to strengthen cost-control and accountability, nurture academic excellence, and enhance academic freedom. We have achieved impressive momentum in restoring the promise of higher education and trust that it will carry us forward in 2018 and beyond.